A man who lived near the eastern U.S. city of Baltimore and thrilled thousands of children by impersonating the fictional hero Batman at hospitals and charity events was struck and killed on a high-speed interstate highway late Sunday. The story of Leonard Robinson's death appeared on U.S. regional newswires by Monday afternoon. By evening, the story of the 51-year-old philanthropist had spread across the country to Europe and beyond. Police say Robinson, in full Batman regalia, was about halfway home from a weekend festival in Charleston, West Virginia when he developed car trouble and stopped to check the engine of his replica Batmobile. He was killed when a car sideswiped Robinson's vehicle as he stood over the engine. Festival official Sharon Sumpter-Dietz told the Associated Press that Robinson had met hundreds of children at the festival over the weekend and at visits to daycare centers and a library. "He always told the children how much he valued them and how good they were," she said. Robinson's Batman exploits gained national attention in 2012, when a police officer near Washington, D.C. stopped his vehicle for a license plate infraction and Batman emerged from the car. What followed was a hilarious sequence of events that included the police officer asking the costumed action hero if he could take photographs of him. Robinson complied, and dash camera video of the event filmed from the police car went viral on the Internet. Robinson began visiting hospitalized children in 2001, masquerading as his son's favorite superhero. His father said Robinson averaged about 18 visits a year to hospitals, schools and charity events, providing toys and autographs, while discouraging his rapt audiences from bullying and other bad behaviors. Robinson operated a successful commercial cleaning business in Baltimore and sold it to a larger company, allowing him to devote much of his time and money to the children. The Washington Post in 2012 said Robinson spent $25,000 a year of his own money on Batman-related gifts for children. 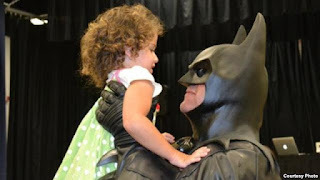 Robinson's website said Robinson's mission was "to entertain ill and terminally-ill children by appearing to them as Batman and teaching them" that "there is always hope.. no matter how long their health battles may be."